Summer is almost over, but it's not gone yet. While many of the Reston pools have closed for the season, there is plenty of water fun to be had. Take advantage of the next few weekends to get on the water! Standup paddle boarding (SUP) is taking the water sports world by storm. Called Hoe he'e nalu in the Hawaiian language (which is just a fun fact to know), paddle boarding started as an offshoot of surfing... only much, much easier. The concept is simple--you stand on a surf style board and use a long paddle to move across the water. You can do it on flat water, like the Reston lakes, or in the open water. It's a fun sport anyone can enjoy. 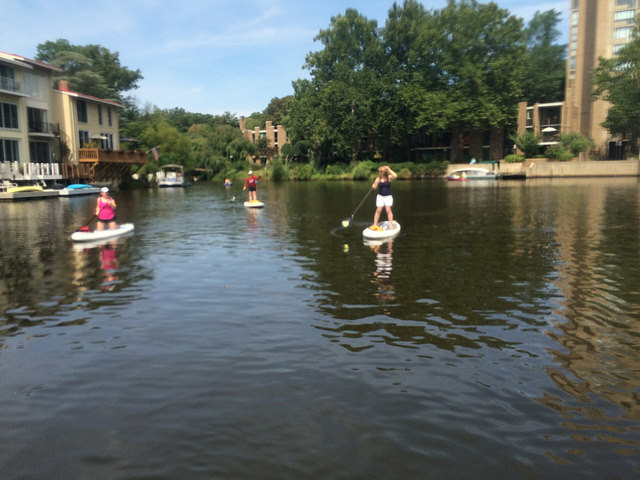 And we are lucky in Reston to have a company that offers SUP workshops on our Reston lakes--Surf Reston. They offer workshops at Lake Anne, Lake Audubon, Lake Thoreau and Lake Newport. The company started as a way to build a community of individuals who enjoy paddling; they teach how to paddle responsibly and safely and give their customers the opportunities to connect with other enthusiasts. Sign up for one of their workshops today! Better yet, get a group of friends to do it together. It's a blast. Until Labor Day weekend, you can enjoy a leisurely paddle around Lake Anne. Reston Association provides kayak, canoe, and paddle boat rentals by the hour. It's a fun way to spend a summer evening! You can purchase tickets at Reston's Used Book Shop, 1623 Washington Plaza (near the fountain). Contact the book shop by calling 703-435-9772. The cost is $6 per boat for 1-hour rental. Hours of Operation are:Thursdays, 4 - 8 p.m. Fridays, 4 - 8 p.m. Saturdays, 9 a.m. - 5 p.m. Sundays, 11 a.m. - 5 p.m. Enjoy these last few weeks of summer break. Maybe I'll see you out on the lakes! Most of the Reston condominiums built in the 1970's look nondescript from the outside. There is no way around it--they are boxy and plain. But if you take the time to go inside, you will be pleasantly surprised. Vantage Hill is a wonderful example of this. Vantage Hill sits on 15 beautifully wooded acres that have been designated a Backyard Wildlife Habitat by the National Wildlife Federation. That's 15 acres for 152 units or, more than 4,000 square feet per unit. And then there are the spacious interiors. These may be condominiums, but that doesn't mean you have to give up space. The units are generally 2 or 3 bedrooms with generous floor plans, ample closets and spacious kitchens. One of the beautiful things about these older condominiums is that most of them have been updated--new kitchens, new bathrooms, and new flooring. It's the best of both worlds--the solid construction and beautiful landscape of the 70's with the beautiful interiors and modern designs of today. Utilities are included in the condo fees. Vantage Hill is located between Reston Town Center and Lake Anne Village Center, with an easy walk to either. It's about a five-minute walk to Lake Anne Elementary School. Older children attend Langston Hughes Middle School and South Lake High School. Lake Anne Jazz and Blues Festival 2014--a gorgeous day on the plaza. Labor Day weekend--the last hurrah before summer officially ends. 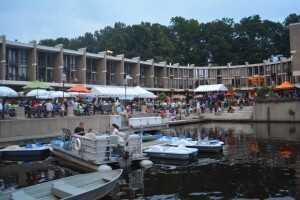 We celebrate the holiday in style here in Reston with the annual Lake Anne Jazz and Blues Festival--one of my absolute favorite events of the whole year. If you're new to Reston, or have never made it down to Lake Anne for this event, make sure to put it on your calendar. In fact, the Lake Anne Jazz and Blues Festival is so much fun, it's going to be an entire week this year. The fun starts August 30 and culminates on Saturday, September 5. And the best part is it is free. Fun for the whole family, this festival showcases talented local emerging artists and national jazz performers. Not only will there be great music, the Lake Anne merchants are featuring specials and there will be a fun featured film as part of the ongoing Summer Film Festival series. Chesapeake Chocolates: Special Edition chocolate musical notes and instruments. Wine Tasting Sept. 3 from 5:30 to 7:30p.m. But that's only until Saturday, you say. You are right. So on Labor Day, head down the road to Herndon for the annual Herndon Labor Day Festival! It's Monday, September 7, 2015 from 11:00 a.m. to 5:00 p.m. on the Herndon Town Green (777 Lynn Street, Herndon, VA 20170). There will be tastings of Virginia wines and craft beers, great music, a craft show, sponsor gallery, and food vendors. The Herndon Parks and Recreation Department and the Herndon Woman's Club produce this fun event. Admission Wine, Craft Brew Tastings and Entertainment - $20 (ID required to purchase tastings) Concert only or designated driver - $5 Extra beer tastings - $2 per ticket- Cash only at gate - Children 12 and under free - No pets allowed - Wine and craft brew tasting and selling of open containers ends at 4 p.m. Enjoy your last official weekend of summer. I know I'm looking forward to it! When developing the "last remaining parcel of land in the prestigious Reston community of Lake Anne," the plans had better be great. Designed by Berkus Group Architects, a company well known for producing environmentally sensitive designs, and developed by Miller & Smith, Orchard Green Cluster Reston VA is, indeed, a great design. Backing into the trails that lead to Lake Anne and situated across the street from the Hook Road recreational area, Orchard Green Cluster is in prime spot for active Restonians. Built in 1983, these 50 townhomes come in four floor plans. They range in size from 1,900 square feet to 2,700 square. Some of the homes have garages, while other have carports and some have fireplaces (which are great on cold winter nights). All are well designed with ample space to grow and change as needed. 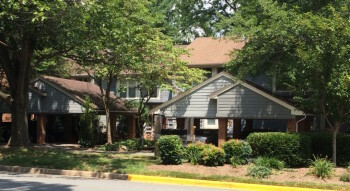 While Orchard Green Reston VA is walking distance to Lake Anne and Reston Town Center, it is also accessible to all the major roadways that take you wherever you want to go. Children attend Lake Anne Elementary, Langston Hughes Middle School, South Lakes High School.